Today I met with the Emmett Spinners at the Triangle Restaurant in Sweet, Idaho and my friend, Cheri, showed me how to ply singles. 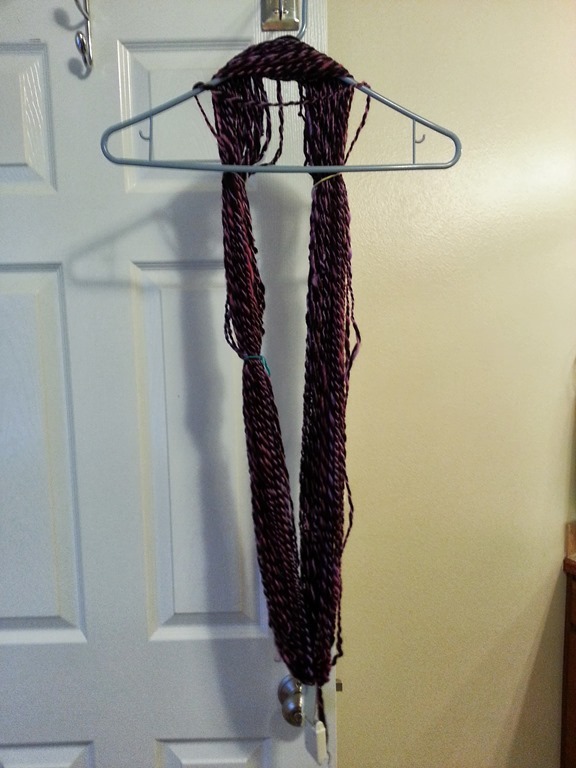 The pink is from Fiber Train 2012 and the dark brown is from Fiber Train 2013, held over Memorial Day weekend in Nampa, Idaho. 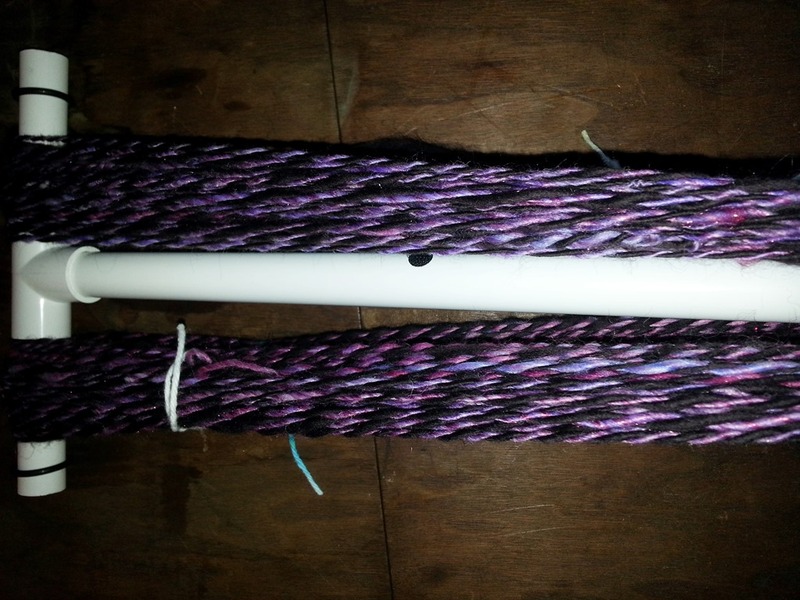 The photo of the yarn on the bobbin looks black, but it’s really a wonderful color of dark brown that has a tint of cherry to it. I only have standard sized bobbins so I had to break it a part and ply them on 2 different bobbins to use up all of the brown singles. That means I don’t have one long hank of yarn and I joined the ends with knots. I chose knots for now, because I have no idea what this is going to become and I just want it held together all in one skein. Oh, wait, I still have more of the pink to ply with brown before I will be completely finished. I also got instruction from Rhonda on how to set the twist on the yarn. I was so excited about having come this far I didn’t want to stop, so after I left the get together I went to Puffy Mondaes and bought a PVC pipe niddy noddy. During the winding process some of the twist came out of the yarn. Eventually I cut that part out and re-worked it and then added it back in with another knot. 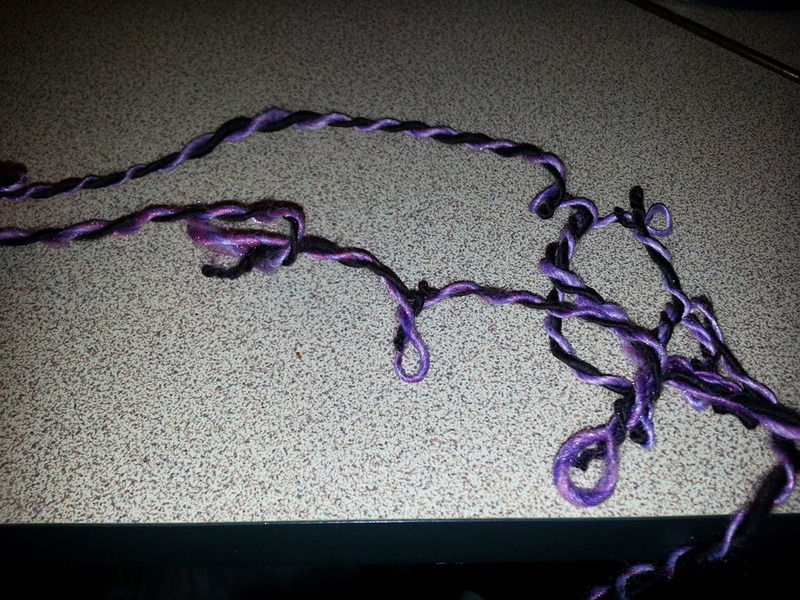 Purposely adding knots isn’t ideal, but it was either that or lose out on precious yardage. It only weighs in at 3.8 oz. Also, I was on the phone with my brother and didn’t have the patience to wait until after the call to research the problem on YouTube or post to the forums. I really don’t have any patience, despite what I hear when people look at my quilting! And now I have yarn hanging in my bathroom! I had planned to spin more of the brown roving tonight, as I didn’t have the same amount of brown singles as I did pink singles when I started today but I’d forgotten my bag of goodies at the restaurant that included the very item I needed to accomplish this task. So, it’ll have to wait for another time because I have a lot of quilting to do tomorrow! 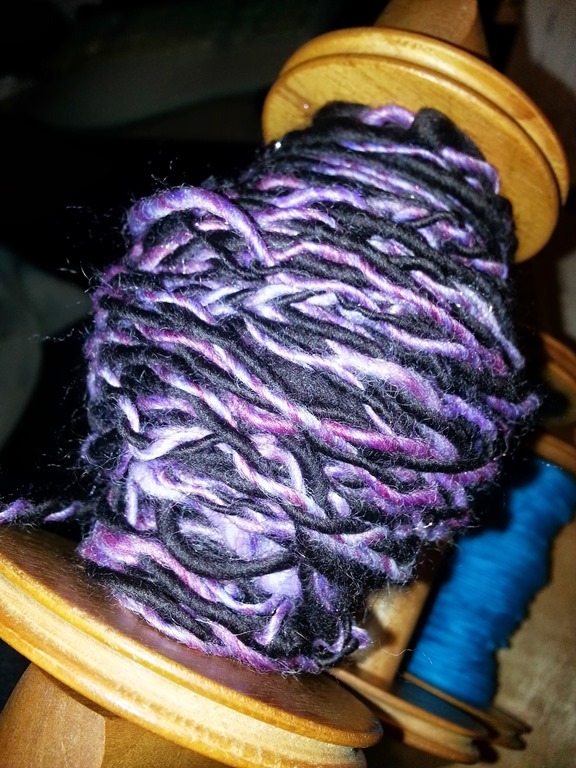 I can’t believe I finally plied something! This entry was posted in Handspun, Spinning and tagged Handspun, Spinning.